IN previous parts of this multi-part investigation, namely [1, 2, 3, 4, 5], we rather politely talked about the people who turned the EPO into the gestEPO. "Gestapo" is what some people call the Investigative Unit internally, equating it with Geheime Staatspolizei, or the Secret State Police. “The Investigative Unit of the European Patent Office,” one source told us, “was created by Mr Battistelli in 2012. Officially, this unit was designed to protect the organisation from fraud and corruption. It was also presented as a “service to EPO colleagues” in order to protect the weak against the strong. However, when the I.U. reported that all allegations of corruption against Željko Topić were unfounded it became clear that this unit was just a political police in the hands of Mr Battistelli.” It should be noted that Željko Topić lost his case, so the allegations are quite likely true, at least on the balance of probabilities, and more criminal charges remain. In light of this, Topić seemed to be an apt addition to the gestEPO. Today we continue providing some background information about various individual members of the Investigative Unit. We focus on high-level people and we strongly adhere to the principle that we should only use information which is already publicly accessible. It’s not an attack on people’s privacy but a criticism of their track record at the EPO, where many overly stressed people commit suicide. “It’s not an attack on people’s privacy but a criticism of their track record at the EPO, where many overly stressed people commit suicide.”This article focuses on Sebastian Bauer, who is the Chief Investigator at the I.U. “One of the key players in Zanghi’s team,” told us a source, “is a “gentleman” by the name of Sebastian Bauer who is noted for his sartorial elegance. His full resumé can be found on LinkedIn (don’t click if/whilst logged in, as that may accidentally reveal one’s identity to him; here is a local copy [PDF]). As the resumé makes quite evident, Mr. Bauer started off his career as a humble trainee law clerk in the Public Prosecutor’s Office in Munich in 2004, but it soon became clear that he was destined for greater things. –Anonymous sourceWe wish to kindly remind (or inform) readers of a long history of World Bank whistleblowers, some better known than others (whistleblower.org has a partial list). By 2011, Mr. Bauer had advanced to the role of “Investigator” at the World Bank where his duties included “Investigation of staff misconduct”, “Resolution of workplace grievances” and “Outreach and communication to staff members on internal grievance procedures”. He joined the EPO in March 2012, where he was initially attached to the Legal Services Department. It is rumoured, based on our sources, that he played a key role in drafting the “Guidelines for Investigations”, the notorious “Circular No. 342″ which we covered in parts I and II. After the entry into force of “Circular No. 342″, Bauer joined the newly-formed Investigative Unit in January 2013. In the mean time he had made quite a name for himself with his reputedly aggressive interrogation techniques which are said to include the skillful application of the “Reid Technique”. This seems to be similar to the method used on Quinn Norton to overzealously manufacture a case against Aaron Swartz, who later committed suicide. Watch the interview with a weeping Norton in the film “The Internet’s Own Boy: The Story of Aaron Swartz” (free to watch), a timely film by Brian Knappenberger because yesterday was Aaron Swartz Day. Mr. Bauer should be made aware of the dire consequence of the Reid technique. Again, Mr. Bauer should be made aware of the potential consequences of continuing these practices. “There are also many rumours in circulation,” said our source, “which suggest that he is quite adept at “constructing” allegations and misrepresenting facts to the detriment of those under investigation. 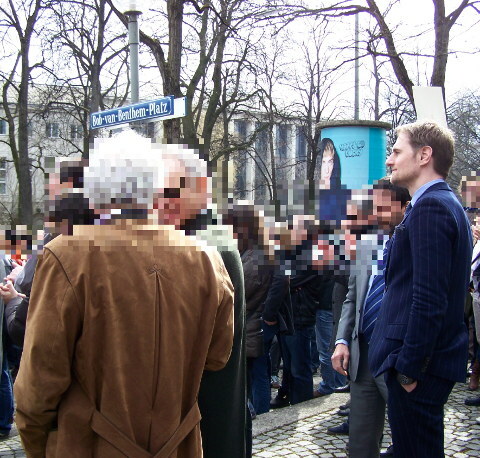 The photo above is a photo of a demonstration in front of the EPO’s main building in Munich, where he could be seen keeping a watchful eye on the protesters. To date, the Investigative Unit has relied on the EPO’s immunity to protect itself from such unpleasant legal consequences. “Some people inside the EPO’s management seem to believe that as public servants they have a right to remain invisible and never be criticised for their actions.”However, with the recent motion passed by the Dutch Parliament which called on the Dutch Government to take action to ensure that the EPO complies with international legal norms and which also called for limits to be imposed on the immunity of international organisations in cases involving breaches of national rules, the legal landscape may be slowly changing in this regard. See this new comment from the same person. I myself have already considered (and was pressing to take) legal action against EPO individuals, for reasons that shall become apparent later this month. There is a lot more to come. Some people inside the EPO’s management seem to believe that as public servants they have a right to remain invisible and never be criticised for their actions. We don’t actually infringe the privacy of anyone; this stuff is already in the public domain. The close-up photo of Sebastian Bauer, for example (in the resumé extracted from his public profile), actually comes from a LinkedIn profile, which is publicly accessible. A La Oficina Europea de Patentes (OEP) no le gusta el Español, Así que PorQué los Espańoles la Toleran? The European Patent Office (EPO) Doesn’t Like Spanish, So Why Should the Spanish Tolerate the EPO?